No Room for Pride or Ego. When you ask questions, you get answers. Those answers become wisdom; questions produce understanding knowledge-wisdom. Sometimes, our weird mind thinks, “Normally, I have no questions; I’m happy. Now that I’ve been listening to Lama carrying on, I’m confused. I have so many questions. 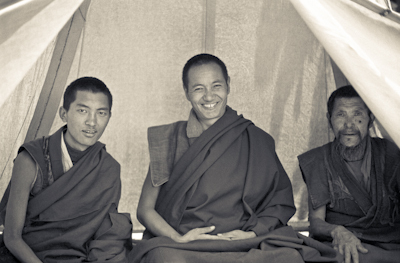 All I get from listening to Lama is questions.” That’s possible. When you’re under the control of wrong conceptions and the superficial view, you have no questions, but when you begin to understand how your false conceptions and projections work, serious questions arise. That’s worthwhile. Anyway, during this retreat I should be giving each of you personal interviews, but you are too many and we don’t have enough time. Therefore, if my talks have created any confusion or difficulty, now is the time to ask any questions that you might have. Question: I find it very difficult to concentrate on only one thing. I have many distractions, both inner and outer, which are difficult to ignore, and I can’t keep my meditation focused on the object of concentration. Lama: I’ve addressed that already. Whenever distraction arises, whether it be a dog barking or the memory of some old experience, instead of reacting negatively and trying to force it out of your consciousness, just watch the thought—how it comes and goes. When you watch your thoughts with wisdom they disappear of their own accord. If you don’t watch with wisdom, thoughts appear; if you watch with wisdom, they disappear. That’s their nature. Once the distraction has gone you automatically revert to single-pointed attention on your object of concentration. Another technique you can use with distracting thoughts is to see how you feel when they arise. Instead of looking at them like an outside observer, “Oh, what is that?” concentrate on feeling; pay more attention to how you feel. Examine how sense perception registers in your consciousness, how you interpret it and how you feel. Question: How long do we hold our breath when we do the vase breathing exercise? Lama: Start with what’s comfortable, but do try to extend the period. At first you’ll find it difficult to control your breath but it becomes easier with time. On inhalation, hold it for as long as you can but on exhalation, don’t hold it out too long. Exhale naturally, slowly and completely, and once you have, again inhale naturally, slowly and completely—with strong concentration. If you do this properly, your mind and nervous system will automatically relax. They’ll be calm and quiet. If your concentration is strong, you’ll feel as if you’ve almost stopped breathing. That’s the experience, although it takes time to reach that stage. But if you have excellent concentration, your breathing will be completely silent. The first time new students meditate their breathing can be really noisy, but with experience it gets quieter and more peaceful. The breathing meditation is a very useful technique to master because in our busy society, with work and everything else, it’s very simple to take a moment and focus on your breath. Whether you’re at work, in a restaurant or wherever, you can concentrate on the movement of your breath and your sensations. You don’t need any other object of concentration. This is very helpful for integrating your mind. 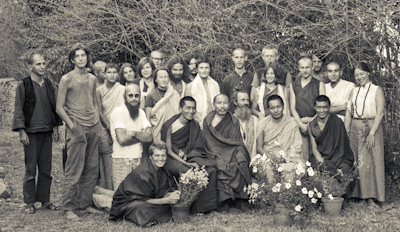 Group photo from the first meditation course held at Kopan Monastery, April, 1971. Question: I’m more distracted by shapes and colors than by discursive thought. I like to watch them. Are these really distractions? Lama: It depends. If you remain concentrated on feeling but at the same time get an impression of different shapes and colors passing by, that’s not distraction. But if your mind moves away from the object of concentration and pays more attention to the shape or color, then at that time, yes, you’re distracted. Just having an impression of something else in your mind is not necessarily a distraction. Question: If my meditation is going well and I’m not getting distracted for long periods I get quite pleased with myself, but then I feel guilty about being pleased with myself. Is this just my ego? Lama: Definitely. But you don’t have to feel guilty about recognizing that your meditation is going well. Instead of feeling egocentric pride, dedicate your meditation to others. Then your ego won’t arise. Think, “This meditation is for others. I’m not doing it because I’m obsessed with my own problems. I have dedicated my life to the welfare of others. Should I feel happy and joyful as a result, may my good behavior and positive actions make others feel good. This is my practice of charity.” Offering your friends good instead of selfish behavior is most worthwhile; it helps other sentient beings. There’s no pride involved in this. You want to create a positive environment for others; you want to give them a good visualization by improving yourself and becoming a good example. If you dedicate your meditation and other actions in that way there’ll be no room for pride or ego. It’s most necessary to do this. Remember what I said at the beginning of the course: don’t expect me to give you any big realizations in these five short days. I asked you to think, “Whatever happens during this course, I don’t care. Recognizing how selfish I have been for countless lives, I dedicate the next five days to benefiting others.” If you do that, no matter what I say, no matter what happens during the course, everything you do during these five days becomes powerfully positive. Thus you can see that whether your meditation becomes positive or negative depends on your own mind. I’m saying this for all of you, not just in reply to that question. 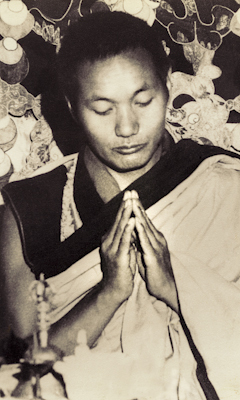 Lama Yeshe doing puja (spiritual practice) in the “old gompa” (shrine room), Kopan Monastery, 1971. Question: If I enjoy things like food and music, is that the same as being attached to them, and if so, how do I stop the attachment? 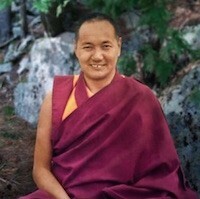 Lama: You stop attachment by understanding what it is and how it works. When, for example, you realize how attachment grasps at more food than you need, it will stop naturally. You can’t stop it by generating some kind of radical, rejecting mind. Understanding brings natural change; when you understand attachment to food, it will automatically change into detachment. Satisfaction has to do with the mind, not the amount of food you eat. Also, listening to music isn’t necessarily negative. That, too, depends on your mind. When you listen to music, analyze how the sound is produced, how it comes through your sense of ear and registers in your consciousness and how attachment clings to it. In that way, listening to music becomes analytical meditation and a form of wisdom.